A key basic fact of owning and managing sheep is that they need herding, funnelling, restraining and confining if the simplest or complex management tasks need to be carried out. 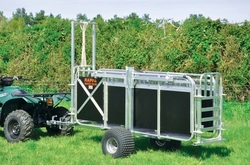 Therefore a sheep handling system is essential even if you are dealing with only a small flock! We know exactly what works when it comes supplying mobile handling systems and offer solutions that are strong, quick and user friendly. Simple, robust and easy to set up systems make shepherding more efficient whether handling sheep at home or away. If you are looking for new equipment, want to trade in old equipment for new or simply want to purchase second hand then call us. We have demonstration mobile yards available for viewing and can develop a solutions to suit your requirements and budget. The Rappa Mobile Yard is the strongest, quickest and most user-friendly mobile yard on the market. Simple, robust and easy to set up, it makes short work of today's shepherding tasks and is the ideal solution for handling sheep both at home or away. For the latest RAPPA Price List & Order Form call 0843 5065430.